Try this easy raw Thai Broccoli Salad + Peanut Dressing for lunch this week! It’s vegan, gluten free, and packed with delicious flavor! With the holiday of love right around the corner, I’ve been sharing a lot of desserts lately. Which means I’ve been testing and eating a lot of desserts. I ain’t mad about it, but every now and then my body is like “whoa sis” and I’ll suddenly crave some green. And, I’ll eat some green and then go about my dessert consumption 🙂 jkkkk (kinda). So, as I made some mason jar salads for my YouTube channel, I decided to make an Asian inspired broccoli rice salad that’s packed with flavors and textures. I don’t know exactly what makes this “Thai” but nevertheless I called it Thai Broccoli Salad with Peanut Dressing. I think it’s the chopped peanuts, cilantro, mint, and peanut sauce that really inspired the Thai vibe. I made my broccoli into some broccoli rice, but you can use small florets, depending what kind of salad texture you’re going for. We’re loading it up with some chickpeas, carrots, peanuts, and a bunch of cilantro. My favorite part is probably the dressing which is a simple peanut soy sauce that really brings this salad together. So, let’s quit chit chatting and get into this recipe for Thai Broccoli Salad + Peanut Dressing. Divide this into bowls, or transfer to individual mason jars for a delicious meal prep situation. I love this on its own, but it’s also great as a base for protein like grilled chicken, shrimp, or salmon. If making the broccoli rice, place the florets in a food processor with a blade. Process for 30 seconds to 1 minute until the broccoli is completely chopped up. Transfer the broccoli rice to a large bowl. Add the chickpeas, grated carrots, chopped peanuts, and cilantro. In a small bowl, whisk together the tamari, peanut butter, sesame oil, and agave nectar. Drizzle the dressing on top of the salad and toss to combine. Once the salad is combine, place in individual bowls or if storing, in mason jars, and top with additional cilantro or peanuts. If making the broccoli rice, place the florets in a food processor with a blade. Process for 30 seconds to 1 minute until the broccoli is completely chopped up. Transfer the broccoli rice to a large bowl. Add the chickpeas, grated carrots, chopped peanuts, cilantro, and mint. In a small bowl, whisk together the tamari, peanut butter, sesame oil, and agave nectar. Drizzle the dressing on top of the salad and toss to combine. Once the salad is combined, place in individual bowls or if storing, in mason jars, and top with additional cilantro or peanuts. Cover and store in fridge until ready to eat. Serves 2 – 4. 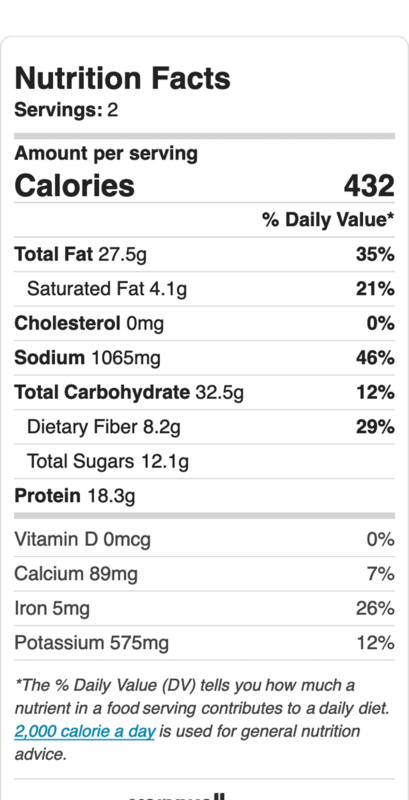 Nutrition facts below are calculated for 2 servings.